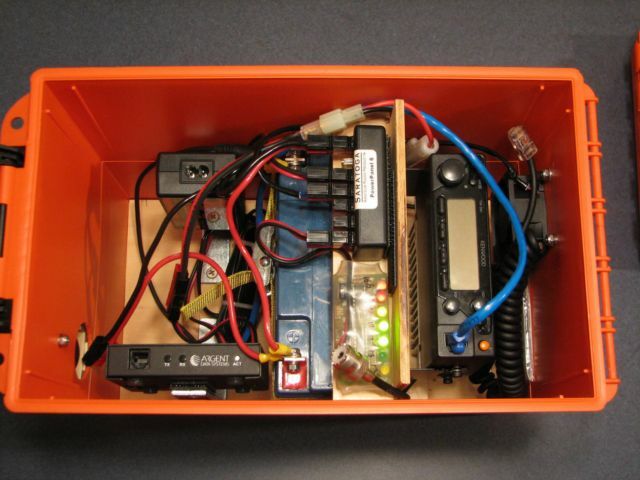 APRS is a system developed by Bob Bruninga, WB4APR, which uses amateur radio to transmit position reports, weather reports, and messages between users. APRS was designed to support rapid, reliable exchange of information for local, tactical real-time information, events or nets. The concept, which dates back to the mid 1980's, is that all relevant information is transmitted immediately to everyone in the net and every station captures that information for consistent and standard display to all participants. In the North Texas area we use this extensively in the support of public service events. In many cases we may be tracking over 20 separate vehicles that are used in the event. The position of these vehicles is plotted on a computer generated map real time so that the event organizers can have situational awareness of the status of the event. During many of these events we also use APRS to transmit short status messages between locations to reduce the amount of voice traffic on the controlled nets. 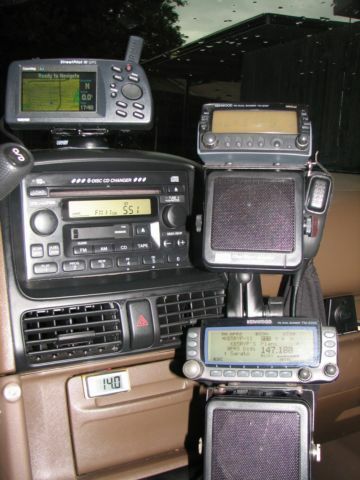 In general APRS system can be constructed very simply and at a low cost. 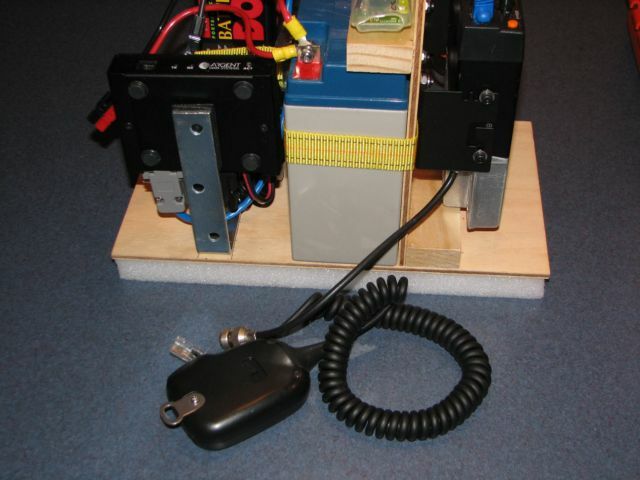 For most applications all you need is a low cost 2 meter radio. Mobile or HT can be used. A GPS receiver and a terminal node controller (TNC) or dedicated tracker interface such as a OpenTracker or TinyTracker. 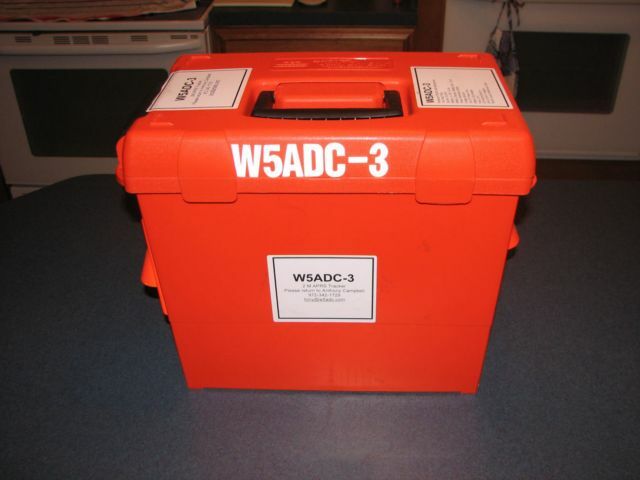 Below are links that you can see some examples of my primary vehicle's (W5ADC-14) location. Well this is my car. In addition to the daily commute, it has been used on many bike rallies as a rover, tail, SAG vehicle and communications lead. Below is the list of equipment currently installed. On some events, I will also install a laptop computer running UI-View to keep track of the other suitably equipped vehicles. 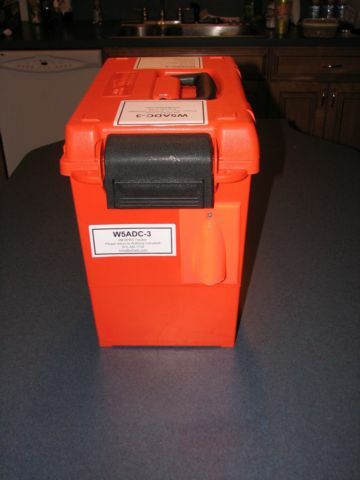 Since the ARPS community in the North Texas area supports many public service events, a number of hams have produced self contained trackers. 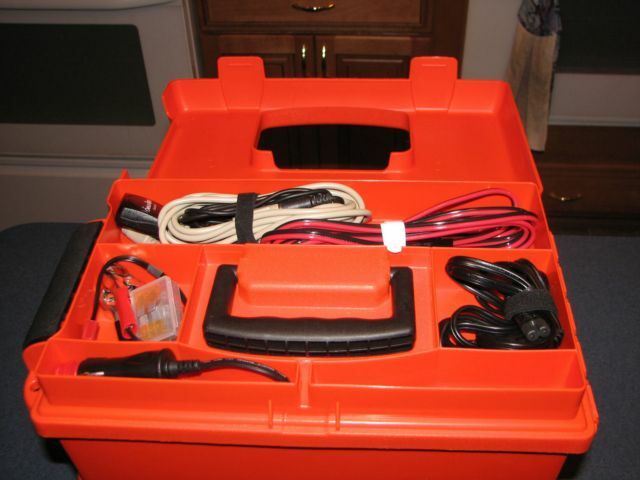 These trackers generally have the ability to be easily installed in another vehicle without reliance on the vehicle for power or antenna connections. Below are some details on my version of this type of tracker. By using the OpenTracker 1m, this tracker is capable of stand alone operation for mover 36 hours with normal beaconing rates. Sine the OpenTracker turns the radio off, when not actually in use, the net amp hour drain on the system is rather low. The notes below will not give you the exact details of the construction, but will hopefully provide you with some good ideas of your own. I do have three identical units and they have worked great for many events. These two pictures show the fan cover, on the right and the cable entrance on the left. While these do reduce the water resistance of the box, they do make it really easy to get cables in and out of the box. As long as they stay upright, this should not present an issue. This configuration has been used outdoors for days without issue. 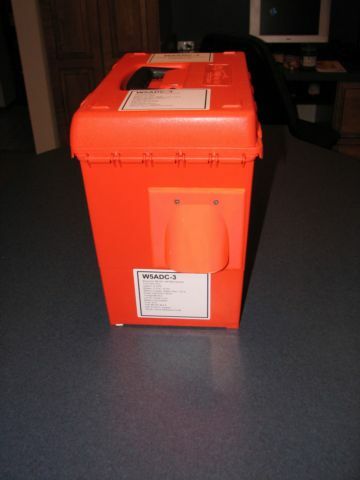 Above is a picture with the top outer lid of the box open. This where the accessories are stored and the GPS receiver is stored when not in use. Here is a shot of the interior of the unit. You can easily see the radio on the left, the battery in the center and the Opentracker on the lower right. The upper right shows the battery charger. This photo shows some of the details of the power distribution system. 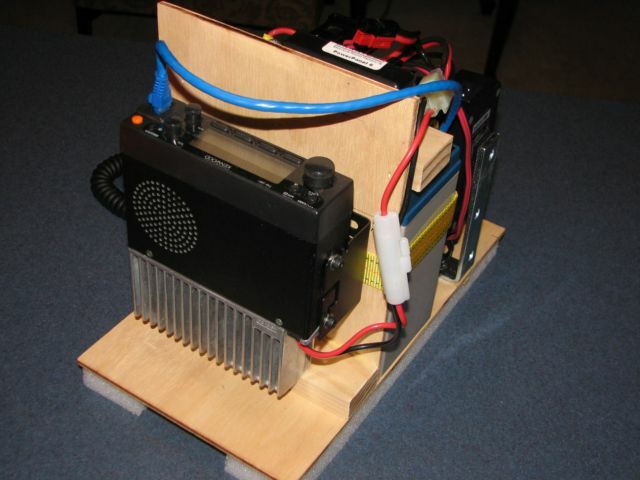 The battery feeds the power distribution block. You can see that all DC connections are made with PowerPole connectors. 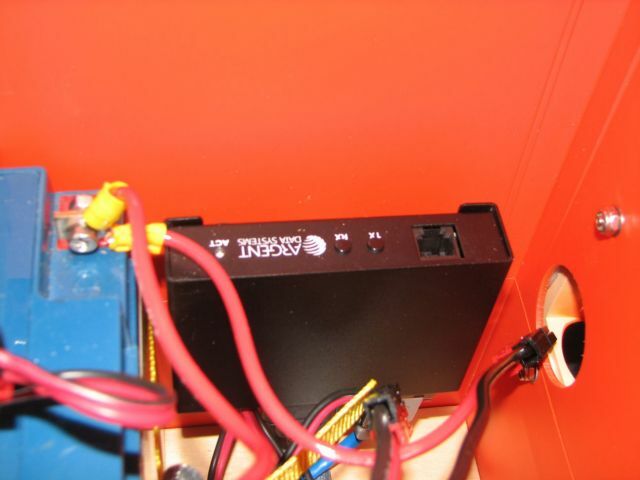 The power distribution block feeds the OpenTracker, fan and Voltage monitor. The radio power is supplied via the OpenTracker. As noted above the OpenTracker only powers the radio during the time that actual transmissions take place. This allows a system like this to operate for more than 36 hours without recharging the battery. The OpenTracker also powers the GPS receiver. 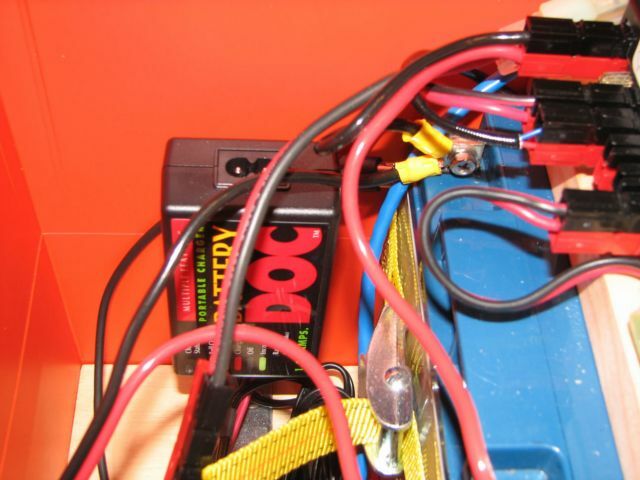 These two pictures show a little more detail of the battery charger and OpenTracker. When the charger is connected to AC power, the system will run without issue. 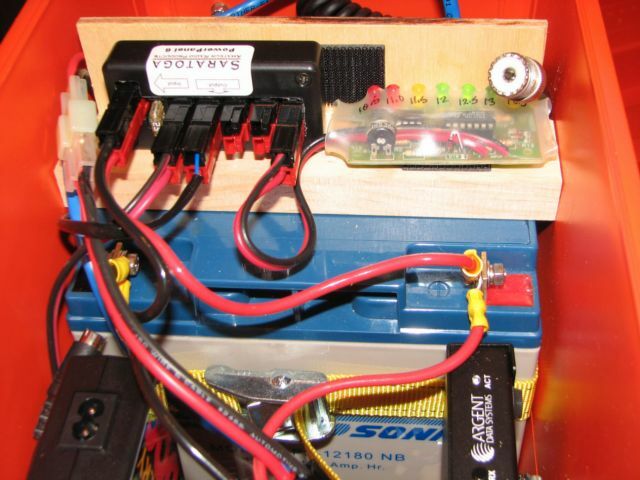 Since the duty cycle is low, the charger always keeps the battery topped off. Here is a view of the tracker removed from the box. As you can see, the construction is rather straight forward. All of the material is available at you local home improvement store. The vertical piece of plywood is sized to contact the interior of the lid when it is closed. This holds everything is place very nicely. Since the power consumption of the system is low, even at full rated transmit power, the equipment does not get hot. The small internal fan also helps keep the equipment cool. Here is the final final construction picture. The radio is mounted with the standard mobile mounting bracket. One nice thing about this particular radio is that the microphone jack has a fixed level audio output that really makes the setup easy. I hope you find this information useful in the construction of your own trackers. Good luck with your projects and please copy and improve on what you find helpful.